An issue of Al-Wafa [الوفاء] newspaper dated May 3, 1907. An issue of Al-Wafa [الوفاء] newspaper dated November 5, 1907. 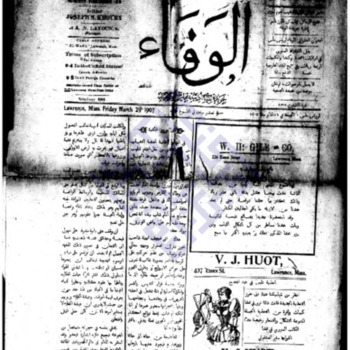 An issue of Al-Wafa [الوفاء] newspaper dated March 29, 1907. An issue of Al-Wafa [الوفاء] newspaper dated April 16, 1907. An issue of Al-Wafa [الوفاء] newspaper dated April 23, 1907. An issue of Al-Wafa [الوفاء] newspaper dated April 26, 1907. An issue of Al-Wafa [الوفاء] newspaper dated April 30, 1907. An issue of Al-Wafa [الوفاء] newspaper dated May 7, 1907. An issue of Al-Wafa [الوفاء] newspaper dated May 14, 1907. An issue of Al-Wafa [الوفاء] newspaper dated May 17, 1907. An issue of Al-Wafa [الوفاء] newspaper dated May 21, 1907. An issue of Al-Wafa [الوفاء] newspaper dated May 24, 1907. An issue of Al-Wafa [الوفاء] newspaper dated May 31, 1907. An issue of Al-Wafa [الوفاء] newspaper dated June 4, 1907. An issue of Al-Wafa [الوفاء] newspaper dated June 7, 1907. An issue of Al-Wafa [الوفاء] newspaper dated June 11, 1907. An issue of Al-Wafa [الوفاء] newspaper dated June 14, 1907. An issue of Al-Wafa [الوفاء] newspaper dated June 18, 1907. An issue of Al-Wafa [الوفاء] newspaper dated June 21, 1907.